As we welcome in a new year, I have been taking time go through closets and gather items that the children have outgrown and prepare them for donation. It always amazes me to think how much the girls have grown in just a year’s time. Materials that I used to keep on the lowest shelves and cupboards for my youngest daughter have now become too low and ready to be placed at a more accessible level for her. The aprons that she once wore to help in the kitchen or use during painting have now become too small and she is ready for the next size. As exciting as it is to see her growing and changing, those sweet little aprons will always carry fond memories of her first steps towards independent activity. I think about all the activities that she can do now and all the new challenges she will be ready for. Just a year ago, she was making her very first cups of orange juice where more juice found its way onto the tray than into the cup! Now, she has mastered the art of orange juicing and is experimenting with smoothie making. I wonder what new skills she will be learning and I anticipate even better memories to come with the new aprons she will be using. Aprons in a Montessori classroom carry more than one purpose. They primarily serve to keep the child’s clothing clean and dry. However; they also bring about a call to action. They bring a moment of consciousness to the task at hand. Just like adult men and women wear special clothing to do certain jobs, an apron brings the same sense of mindfulness, a sense of importance to the work. 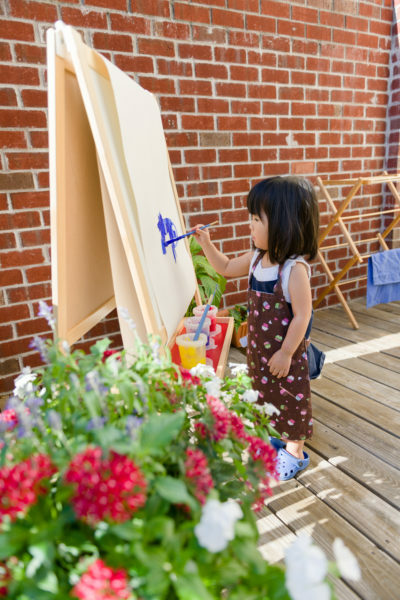 Young children have observed their parents using aprons to do different kinds of work, so they are aware of the significance the use of an apron may carry. In the classroom, aprons are a very important component of practical life exercises. Children wear aprons to do different lessons such as flower arranging, scrubbing tables or baking. They wear aprons to garden, to do wood working and wash cloths. 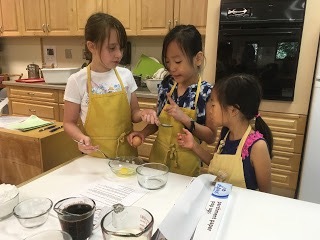 Aprons come in a variety of fabrics and styles, but when offering an apron to a young child, look for a style that features an elastic neck band or a wide opening at the head that allows the child to easily pull the apron on and off. Popular styles used in Montessori classrooms have Velcro straps that the child can use to close the apron with independence. An older child can use a style that has straps that can tie together. If you would like to offer an apron for your child at home, find a place where the item can be consistently stored. An older child can be shown how to fold the apron to store it until needed. A younger child will have more success hanging the apron from an attached tab or by the neckline. A damage free hanging solution, such as a repositionable hook, can be used for this purpose. If you are a crafter or enjoy sewing, there are many free tutorials online for child size aprons. Not an experienced sewer? No problem! You can make one of your own by looking around your home for unused tea towels or hand towels. A simple fold over apron for a young child can be made with a cloth napkin, some ribbon and some iron-on adhesive! There are many free online tutorials that contain direction on making no-sew aprons for children. Try this link for no-sew aprons. Get creative and have fun! Maybe you can make a matching apron for yourself. Let’s talk! Use the comments section to share your favorite memories from last year with your children. Looking for more Montessori inspiration? Subscribe now and join the community!